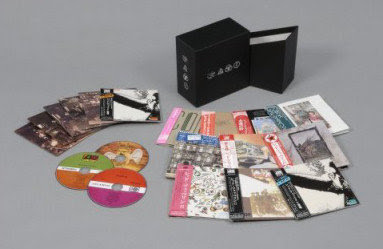 Led Zeppelin The Definitive Box Set - 2008 Japanese exclusive strictly limited edition digitally remastered 12-disc SHM-CD album set (8 single CDs and 2 double sets), comprising the entire LP output from the legendary rockers, from the eponymous 1969 debut through to 1982's posthumous "Coda"; each disc is superbly presented in a mini LP-style card sleeve, housed in a deluxe metallic embossed box - sealed & stickered. Limited to 5000 copies! You Should download all parts.